The Dorset Old Tyme Bulldgge was developed by Steve Barnett in the late 1980's. 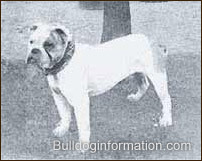 His breeding programme was set out to re-create his ideal bulldog of old, utilising his earlier experiences of the various bulldog crosses he was involved in, some of which went into the foundation stock of the late Ken Mollett's Victorian Bulldog (see book on the right). 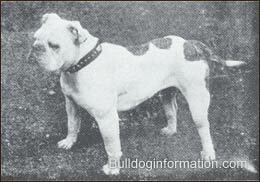 Compare Steve's dog "Monty" (below left) with the 1889's bulldog (below right). 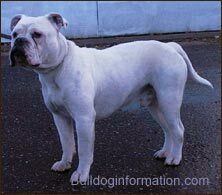 Steve's goal was always "to produce a national bulldog; a dog you can stand alongside proudly, confident in the knowledge that he is an athlete; capable of non-stop energy, looking like a true gladiator; a bulldog both in appearance and temperament. Not a nuisance around animals and other dogs, but with an inbred fire if needed or called upon; a dog that would grace the arena of any show, in any country and be gazed upon with awe and respect." Steve Barnett found his desired bulldogs way back in history, being bred for the kings and queens of the Tudor period as bear and bull baiting dogs. 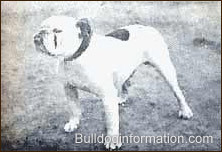 With these early bulldogs that won the hearts and minds of the early writers of the day and that brought national pride to the words English Bulldog in mind, Steve Barnett's began to reproduce a healthy, short-muzzled dog, while retaining its character. During the Tudor period both these bloody sports were at a height of their popularity. The various bear pits lined the south side of the Thames as early as 1506 and were mentioned by Shakespeare and other known writers in their day. Henry the VIII (1509 -47) had a real strong liking and interest, in the early bear pits and bullbaiting, appointing the first official master of the game. Documented in history Queen Elizabeth had a facination for the sport of bull and bear baiting, and she also visited Kenilworth Castle in 1575, then owned by the Earl of Leicester, where 13 bears were assembled for her amusement. 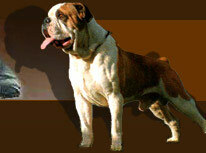 The Dorset Olde Tyme Bulldogge is a medium size dog that stands proud, fearless and confident. It is alert, yet docile and possesses great strength. A real powerhouse, its strong and athletic physique attracts admiring glances and comments wherever it goes. 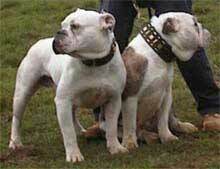 The Dorset olde tyme bulldogge's body is well-proportioned, stocky and very muscular. 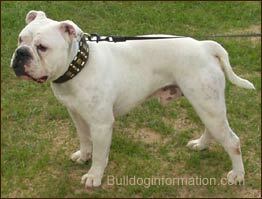 For more info about the Dorset Old Tyme Bulldogge's appearance see: Dorset Old Tyme Bulldogge's standard. 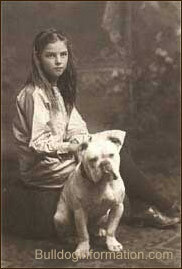 Dorset Olde Tyme Bulldogges are good around other animals, especially when raised with them from puppyhood. This Bulldogge can handle any amount of exercise. If you are active or laid back, the Dorset bulldogge will fit into any life style, keen to lay at your feet or walk at your side. Happy to lie at your feet or walk by your side, this excellent companion is very affectionate. In February 2003, Steve received the United National Kennel Club's Lifetime Achievement Award in recognition of his work with bulldogs and other breeds.